Present generation needs to be aware of robotics and its programming thus school provides robotics training. Robotics classes teach students to build their own robots and program them according to their need. 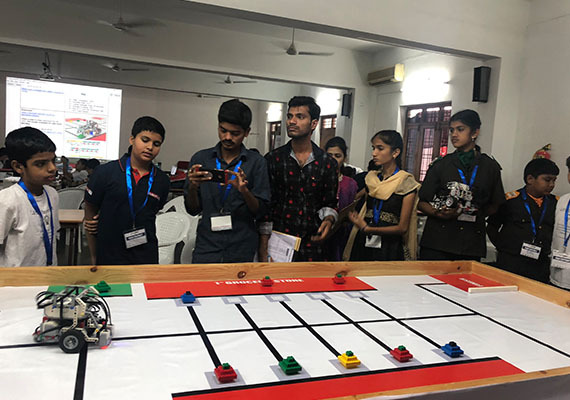 School hosted World Robot Olympiad held in five centers in India. Hyderabad round of WRO was really an inspiration for the students towards robotics. Robots built by many students solving everyday problems were really knowledge gaining..
Students are introduced with the basics of Abacus. Students improve their mathematical skills with the introduction of Abacus. Abacus held for most of the classes for improving their interest in mathematics has really helped students. They became really fast in mathematical calculations after attending these classes based on their interest. DNA workshop is organised for high school students to aware of DNA. The workshop trains the students to view their own DNA extracted from their saliva sample. progresses. Computers as taught is made interesting through the introduction of animation from Classes 1 to 9. Animation is taught for the students to animate by their own. School follows computer curriculum as discussed earlier headed under (1) Basics in computers, (2) Introduction to flowchart and programming and (3) Animation through the books designed by the school which include all these. School encourages the students to learn letter writing, essay writing and to imagine the story of their own and write it in their “I Write” books from Class-III onwards. They are also encouraged to recite their imaginative story in the assembly held every morning. students are encouraged to learn leadership qualities through a regular process of conducting school assemblies by themselves. each student gets more than one chance in an year to address the gathering in three languages of english, hindi and telugu. every year student elections are held and the students are given an opportunity to elect their own student leader in the elections. these student leaders taken an oath in the investiture ceremony held annually. students are divided into the four groups of air, water, fire and earth represented by the basic colours of yellor, blue, red and green. these groups encourage the competitive spirit among the students. these groups are also given their responsibilities. these are improved on a regular basis through regular exercise and a class spared strictly for them. a class wise syllabus for communication skill improvement is carried out through the series of books designed by the school titled ‘communication skills’ for improving communication skills. the purpose of these clubs is to bring out the hidden talent in the students. the fabulous six include pen club, debate club, art club, theatre club, music and dance club and sports club. each club is for the students to choose, based on their choice, a special training is given in each club with a pre planned course designed by experts. to go into the details of these, first, to start with pen club; it is for students in expressing their own world by themselves. debate club is designed for them to express their words in a gathering. art club has a course of cartooning and commercial art and craft guided professionally. 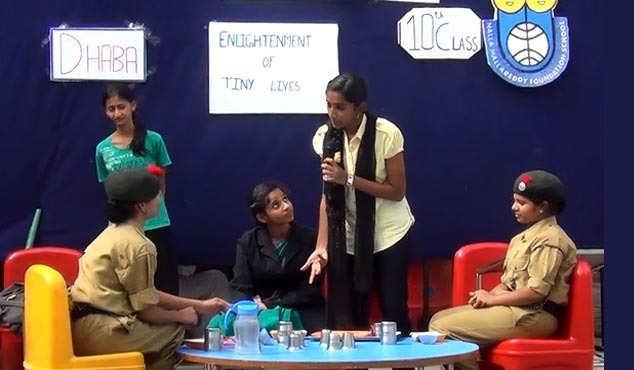 in theatre club a student learns different aspects needed for the life which is enacted by students to build their self confidence. music and dance club teach music and dance under the teacher’s guidance. 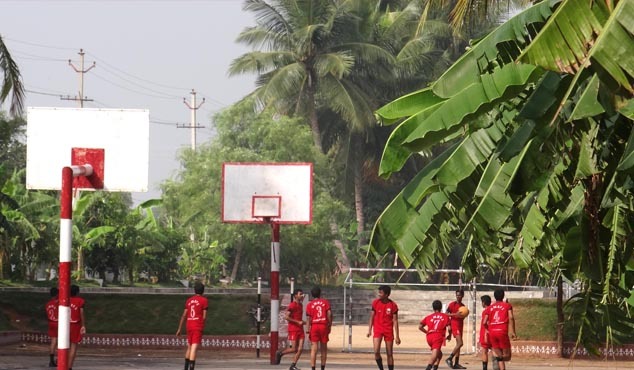 sports club covers different games, marching and other knowledge gaining plays..
each child from class 1 to class 10 are encouraged to read newspapers regularly. they collect news of international, national, regional, sports and entertainment in a book called ‘the world around’. they also check the significance of each day in history. students also explore amazing facts around them. The child’s imagination of their own world is encouraged in the school. They are encouraged to recite a story or a poem from their own imagination addressing the entire school. Thus students who hesitate also come forward with their imagination. Students are trained in drawing and painting and pencil sketching. Special sessions are held to teach Oil painting, Tanjore painting, Charcoal painting and Batik printing. Students are encouraged to attend art competitions at various levels held regularly. School elections are held every year. It starts with campaigning among the students and electing their own representatives. Student leaders are elected through voting. Elections improve participation in society as well as improve leadership qualities among the students. The school is equipped with Nalla Malla Reddy Foundation School Bank which initiates students to save. The students initiate their saving in the bank through the application form filled by themselves and later the student leaders from each group of Air, Water, Fire and Earth look into the day to day running of the bank.